The valley attracts lots of compassionate people with missions to right injustice and atrocities across the globe, but this week the public is invited to hear about one man's crusade to help casualties of the streets of St. Louis and how that mission is effecting dog rescue operations nationwide. Randy Grim works tirelessly with his foundation, Stray Rescue, to save as many homeless and abused dogs as he can. But equally important to him is seeing that laws are in place and legal procedures are followed to ensure that someone is punished. His work is often featured on "Animal Planet" and "National Geographic" and "The Today Show." Melinda Roth told his personal story in "The Man Who Talks to Dogs," and he has published a number of books on his work. St. Louis animal lover Pamela Jensen Wagner has had many encounters with Grim, even before he founded Stray Rescue. "He took a beagle I found that was very sick and had heart worms,"
she said. "He was the only one that would take responsibility for her vet bill and take her out of all the rescues around here. A month later, he took four puppies with mange. I couldn't afford the bills, but he did." Wagner said Grim is always on the street making life easier for stray dogs, and that he garners respect and followers for being in the trenches with his volunteers. "He goes out there and gets the starving dogs off the streets," she said. "I just get carried away when I talk about him because he's such a guardian angel to all the poor, misplaced and abused animals." The personable Grim will be on hand Tuesday, June 26, at Chapter One Bookstore, at its new location on Second Street in Ketchum. 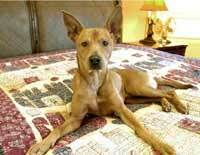 He will have Quentin, a dog who survived a gas chamber and made headlines, with him as he signs books. He took a moment to answer a few questions. With the abuse you find, how do you keep from punching some of these people? < First off. I pray to the dog gods for creating Xanax. Since I'm subject to witnessing some of the worst abuse in the nation, for the dogs' sake, you have to be indifferent at the scene, but knowing the abuser will be behind bars as you build the abuse case helps somewhat. We've had very successful felony abuse cases prosecuted in the city of St. Louis. But of course there are plenty of times I do want to punch the abuser and wish them the worst in life. These are not people, these are monsters. This is a giant issue with roots deep in cultural and societal mores. How do you keep from being discouraged or overwhelmed? Being discouraged, sad and at times depressed is the price I know I have to pay to save the animals, and change the mindset of a city. Thank god for Grey Goose vodka! I have to wonder if the people who need the information are reading your books. And reading some of the scenarios, it's clear some will never change. Is your effort to turn the tide focused on keeping people like the Stray Rescue operation going to repair the damage caused by the insensitivity? I've received many letters from all over the country from people who are about to give up on their dog. They all say, "The book saved the dog's life" and are very grateful that there's a book like that out there. They really seem to connect with my humor, and the reality. My effort is to make sure that Stray Rescue is there for the dogs that are living and dying on the streets and for the dogs who have been tortured. My nirvana would be that the general public starts to become proactive in taking a humane and a full responsibility approach for man's best friend. That even means to re-home the dogs themselves and stop flooding the national shelter system, which is at a breaking point. As a society, it has to be a massive change in the tide, a societal tide of the way we think. Can this be resolved, eventually? Are we getting more conscious or losing more because of the economy? I find the economy excuse a crutch for most people. They can still go to a movie, they can still buy new clothes, they can still go out to dinner, but they can't afford a bag of dog food? Furthermore, almost every major shelter in every major city has programs for the poor where they can get their animal needs basically for free. It's not an economic problem, it's not a dog problem, it's a people problem. Stray Rescue has wonderful programs for the poor. The economy has only affected donations, but has not affected the number of animals that suffer and die on our streets or in our nation's shelters. The decrease will happen as society realizes that it's them, not the dog, that's why everything is so screwed up. Our ultimate goal is to be out of business, but for now that's a pipe dream. What do you hope to accomplish here in Idaho? I hope while in Idaho that maybe I can make a difference in the lives of the dogs and cats in your shelters. Also help to get the message of change. Not just to the communities in Idaho, but all the cities I visit in my journeys to make folks rethink how they view their companion animal, and how to tackle their own personal dog issues with a little bit of fun. And, of course, sell some books so I can help fund Stray Rescue. One hundred percent of all book sales will go directly to the dogs in an emergency medical fund for life-saving surgeries for the abused. Where: Chapter One Bookstore, 340 E. Second St. in Ketchum. When: Tuesday, June 26, at 1 p.m.